The new musical Escape to Margaritaville, featuring the island tunes of Jimmy Buffett, officially opens on Broadway at the Marquis Theatre on March 15. Featuring a book by Greg Garcia and Mike O’Malley and direction by Come From Away Tony winner Christopher Ashley, Escape to Margaritaville began previews on February 16. Paul Alexander Nolan and Alison Luff star. Escape to Margaritaville follows Tully (Nolan) at the titular tropical island resort as he questions his relaxed ways upon meeting (and falling in love with) a career-minded tourist (Luff). The cast of Escape to Margaritaville also includes Lisa Howard as Tammy, Eric Petersen as Brick, Don Sparks as J.D., Andre Ward as Jamal and Rema Webb as Marley. Also in the cast are Matt Allen, Tessa Alves, Sara Andreas, Marjorie Failoni, Steven Good, Angela Grovey, Albert Guerzon, Keely Hutton, Justin Keats, Mike Millan, Justin Mortelliti, Ryann Redmond, Ian Michael Stuart and Brett Thiele. 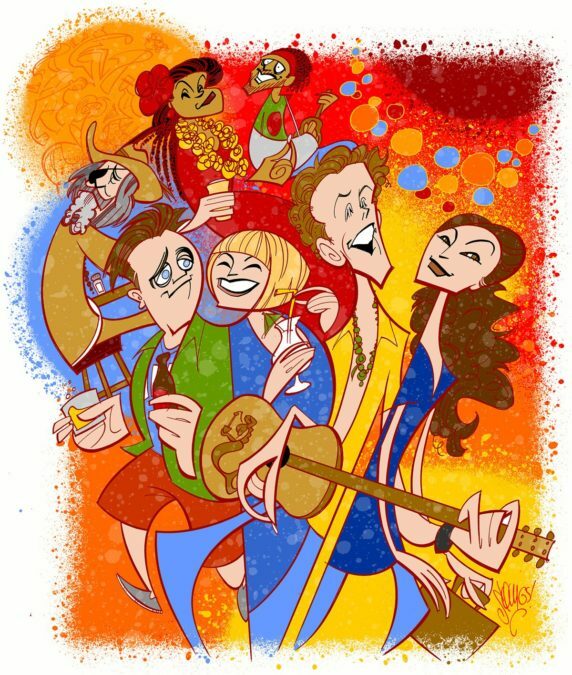 To celebrate the new musical's big night, Broadway.com Resident Artist Justin "Squigs" Robertson sketched a portrait of Nolan, Luff and the talented company having the time of their life on Broadway.